Product Description Dolibarr ERP/CRM is an open source, free software package for small and medium companies, foundations or freelancers. It includes different features for enterprise resource planning (ERP) and customer relationship management (CRM) but also other features for different activities. The application Dolibarr 5.0.3 and prior allows low-privilege users to upload files of dangerous types which can result in arbitrary code execution within the context of the vulnerable application. Dolibarr application allows low-privilege users to upload files. However, the application does not whitelist only certain type of files (e.g. 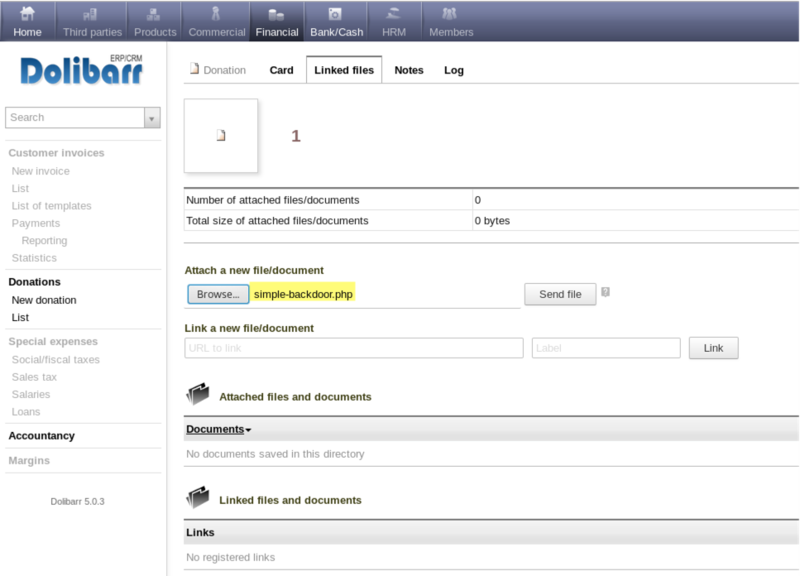 PDF, JPG, PNG, DOCX, etc), instead, any type of files can be uploaded to the filesystem via the application.